Montasio cheese is a cooked semi-hard cheese obtained exclusively from cow’s milk from the production area which covers Friuli Venezia Giulia region, with the whole territory of the provinces of Udine, Pordenone, Gorizia and Trieste, and Veneto region with the whole territory of the provinces of Treviso and Belluno and partially the provinces of Venice and Padua. Montasio has 3 ageing stages: fresh, aged from 60 to 120 days; semi-aged, aged from 5 to 10 months; aged, aged for more than 10 months. Thus the organoleptic features of Montasio cheese are different based on its ageing process: if fresh, it has a soft and delicate flavour that recalls the milk from which it’s produced; the flavour of the semi-aged cheese is more marked and has a particular fullness; the aged version takes on quite an aromatic flavour that isn’t excessive and is great for the consumer that prefers a strong and marked flavour. 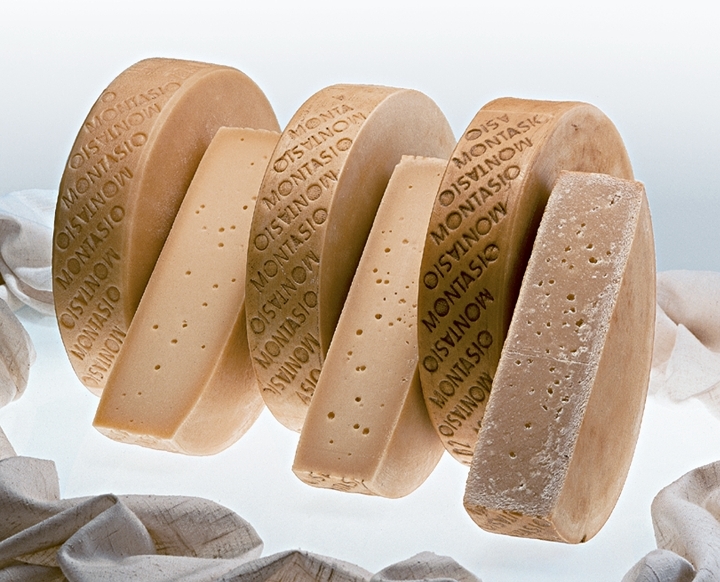 The paste of the Montasio cheese has small, regular, clear holes that are uniform throughout and are characteristic of this cheese. In the fresh Montasio the rind is smooth, elastic, compact and light brown; the paste is compact and white or straw-yellow. As the ageing period extends, the rind becomes drier and the paste becomes grainy and crumbly. 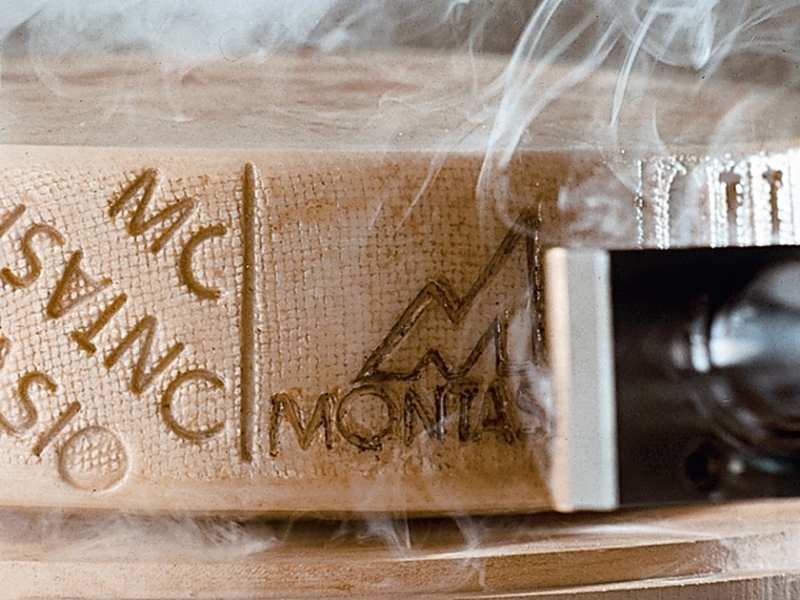 The rounds of Montasio cheese are identified by a distinctive mark on the side of the round, the repetition of “Montasio” in an oblique direction. A second mark, the quality mark, is branded by the commission of the Consortium and identifies the product that has been flawless during an ageing period of more than 100 days.The date of production and the producer’s code is marked on the side. 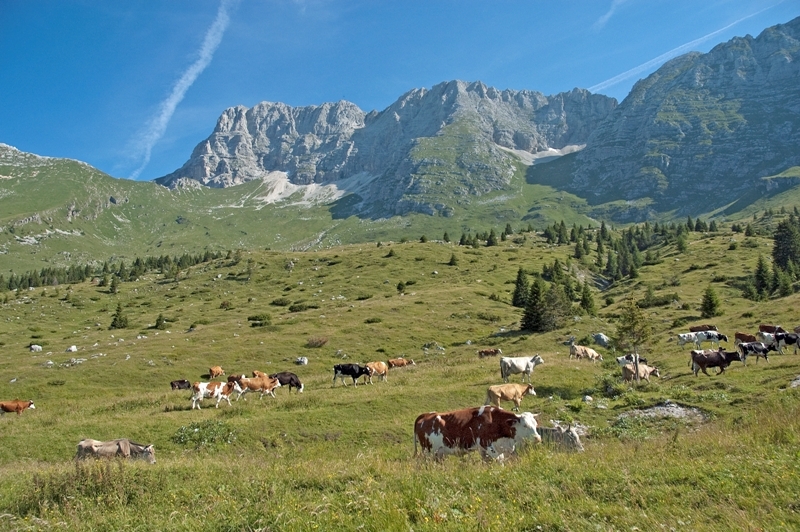 Montasio is part of the big family of alpine cheeses. It was first made at the beginning of the millennium; it was a way to store a product, like milk, that was easily perishable in periods of no or scarce production. Montasio was first produced around 1200 in the valleys of the Julian and Carnic Alps thanks to the perseverance and intelligence of the Benedictine Friars. In Moggio Udinese (on the northern side of the Montasio) there’s a convent, today inhabited by Clarisse nuns, in which the various production techniques of the shepherds of the area were probably refined and recorded. These production techniques were soon diffused in the valleys of the Carnia Alps and in the Friulano-Veneo Plains. The first documents, dated 1775, that mention “Formaggio Montasio” (Montasio cheese) are the price lists of the city of San Daniele; the price of Montasio was higher than average of other cheeses. From that moment on, Montasio was always mentioned in all the commercial documents of north-eastern Italy. Since then, the production techniques have evolved, but the original concept of transformation has been kept intact. As a matter of fact, the milk is transformed into cheese by using non-invasive techniques that don’t upset the original microbial and bacterial flora.This is done by using raw, fresh milk that hasn’t been subjected to vigorous treatments. 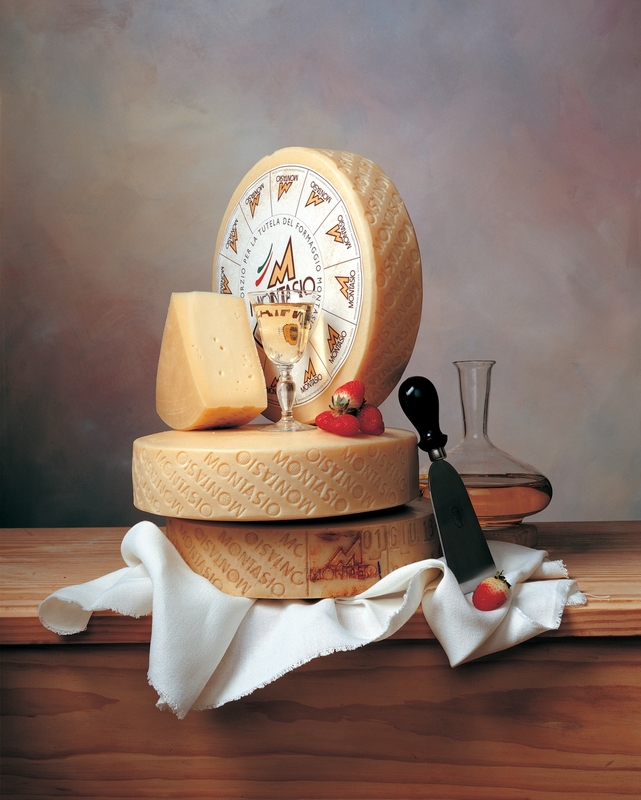 A quality cheese like Montasio must be produced according to determining and very precise factors. 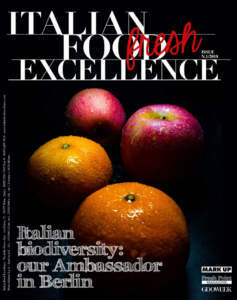 The first fundamental factor is the area of origin, the second one is the milk, a factor that is highly connected to the environment, its climate and its vegetation; the third factor is the use of a non-invasive technology that favours the slow formation of the product. The fourth is the marking of the cheese during its production that guarantees the origin and the observance of all the characteristics stipulated in the specifications. Naturally, as long as it’s the true Montasio with the marking of the Consortium for the Protection of the Montasio cheese. 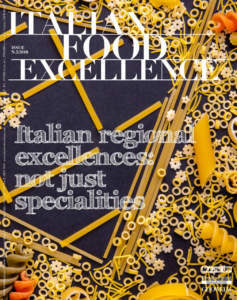 Montasio is mainly sold in the northern Italian market, but also significantly in Toscana, Marche and Lazio. 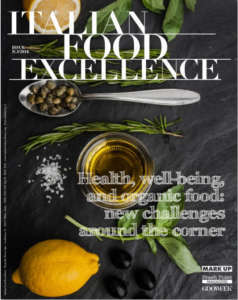 It’s exported onto the European market, mainly French, Benelux and Germany, as well as in countries outside of the European Union, the most important ones being USA, Canada, Australia and some Arab countries. The exports of the associates (producers and agers) are about 2% of production, while the cheese factories that aren’t associated export for a value equal to 4%, this value is in constant and continuous growth. The fresh Montasio (from 60 days to 5 months of ageing) embodies the taste of the great alpine cheeses with particularly soft and delicate flavours. Mezzano (aged 5 to 12 months) has a particular full taste characterized by a unique strong flavour, typical of natural products. The structure becomes more crumbly, but maintains a good consistency. The colour of the cheese tends towards straw-yellow and the rind gets thicker. The aroma becomes significant and marked by the purity of the product. In the aged (aged more than 12 months) version the structure becomes more crumbly and the holes less important. The colour of the cheese becomes yellowish and the rind takes on a light-brown colour. The flavour becomes pleasantly sharp without ever becoming irritating or awkward to the palate. Excellent eated grated on pasta or vegetable soups. Eaten directly in slices, it becomes an excellent pairing for “polenta” and with superior meat.